Go ahead … growl! 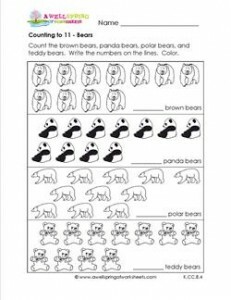 Make it nice an loud so the brown bears, panda bears, polar bears, and teddy bears on this counting to 11 worksheet can hear you loud and clear! Please go to this page to see all the counting numbers 11-20 worksheets in this set.